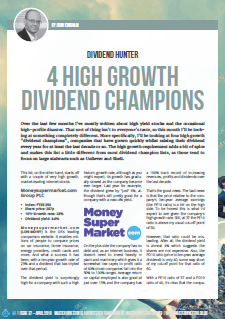 In the latest issue of Master Investor magazine I looked at four high growth “dividend champions”, i.e. companies that have grown quickly whilst raising their dividends every year for the last decade or more. I thought this would make a nice change because in recent month’s I’ve mostly written about high yield stocks and the occasional high-profile disaster. That sort of thing isn’t to everyone’s taste, so this month I thought I’d look at something completely different. The dividend champions in this review are a little different from most dividend champions, largely because they’re also high growth companies. John, As usual, very nice coverage of 4 companies – 3 good companies, irrespective of the price, and Dunelm which I don’t characterise in the same quality as the first three (personally speaking of course for what that’s worth). I agree on your sentiment on the first two and the third one in terms of keeping them closely on a watch list and wait for a market reaction to something that it doesn’t like, that allows some kind of correction. On Dunelm, I consider it to be in some danger, irrespective of it’s seemingly modest (relative) debts. My beef with Dunelm is borne out of recent personal experience in updating our own home and helping the offspring organise their new one’s. In each case Dunelm was considered for soft furnishing’s (curtain’s; bedding; bathroom items such as towels, cushions, pillows, throws, bath mats etc etc) and furniture for bathrooms; bedrooms and even perhaps lounge items. 2. The furniture quality is particularly poor. 4. Competition has grown enormously in the last 5 years to render shopping at Dunelm unnecessary. Competition in particular is the opening up of many of the Range stores, which equally has mixed and some poor quality items but priced well below Dunelm. Secondly many of the items in Dunelm are now in supermarkets and these tend to be of better quality and lower prices. Third and probably more significantly is the continued rise of TKMax and it’s more recent launch of Homesense which offers excellent quality and branded goods at far better prices. I see Dunelm as a possible ToysRUS or a Woolworth’s some way down the line and it would not be a portfolio candidate of mine. Hi LR, thanks as always for the excellent comment. On Dunelm I don’t have any opinions about specific competitors. My assumption is that markets are always competitive and that Dunelm and the other companies you mention always have and always will face strong competition at all times. It is the nature of the capitalist system and I’m all for it. For example, Range has no magical ability to undercut Dunelm on price. If Dunelm wanted, it could match and probably beat Range on price, given Dunelm’s greater scale. Companies compete, they face competitors and they adapt. There is no reason for Dunelm to just sit there while other companies advance. So some people still like Dunelm it seems! As for the Dunelm/Toys r us/Woolworths comparison, I don’t think it stands up. Both of those other companies were laden with huge amounts of debt, which Dunelm isn’t. Sorry for bashing your points, you are welcome to bash mine if you like! And as usual, I don’t actually hold strong opinions about Dunelm’s future even though I’m a shareholder. 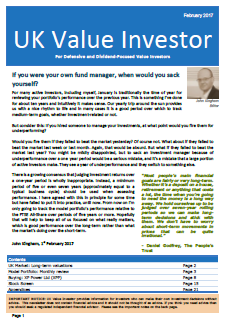 The performance of my overall portfolio is far more important than the fate of any single investment. John, Thanks for the interesting article. Diploma is relatively new to me so it was interesting to read about. I would personally be somewhat wary of Dunelm for the reasons alluded to by LR. It is a relatively competitive space and Dunelm could be at risk from online only competition. In my view, valuation is only one form of the “margin of safety.” We also have to look for companies with sustainable competitive advantages. Rightmove has this but it isn’t clear that Dunelm does. Moneysupermarket is somewhere in-between with a strong brand and three other major competitors. 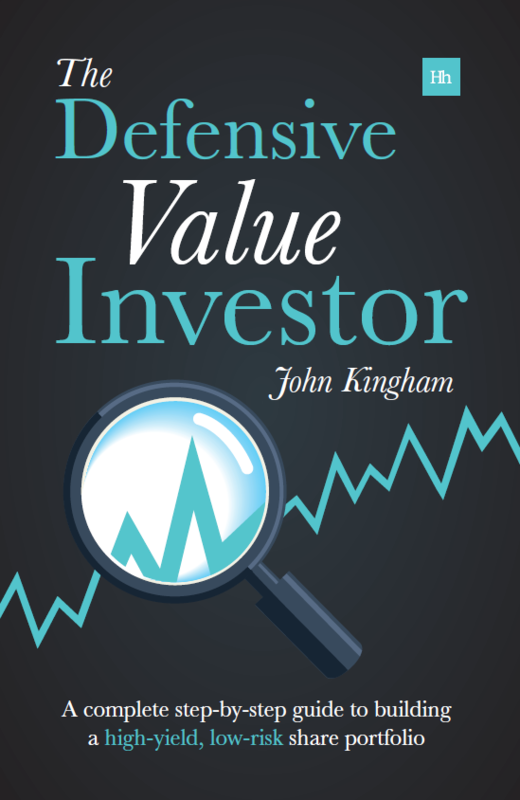 Interesting use of last 10 year’s dividend or earnings as a valuation tool. For me this doesn’t really make sense as I would only focus on recent earnings. I can see why you might use it given that cyclical or volatile companies are worth less than companies with stable earnings. However, the approach also punishes growing companies that can reinvest their earnings to grow profits. On the valuation front I wouldn’t be as strict about things. In the long-term the importance of valuation declines relative to quality. In the great companies there is unlikely to ever be a buying opportunity at a very low price. Hi Andrew, I think our differences mainly come down to different preferences for quality and value. You fall towards the QARP (quality at a reasonable price) end of the spectrum and I’m more in the middle, sometimes willing to pay a fair price for a wonderful company and sometimes willing to pay a wonderful price for a fair company. As for high growth companies, yes they do typically have higher PE10 and PD10 ratios, which in isolation would make them appear less attractive, but those companies also score highly on my Growth Rate and Growth Quality scores. So in most cases the negative impact of a higher PE10 ratio and the positive impact of a higher Growth Rate and Growth Quality probably cancel each other out (more or less), which is exactly what I want. In other words, a higher growth company on a higher valuation might look just as attractive as a lower growth company on a lower valuation.